Stagecoach in South Wales is supporting military personnel past and present this Remembrance Sunday (11 November 2018). This year as part of the transport companies activities to commemorate the contribution of British and Commonwealth military and civilian servicemen and women in the two World Wars and later conflicts. A contribution has been made to the Royal British Legion, enabling all drivers who choose to wear a poppy to do so. 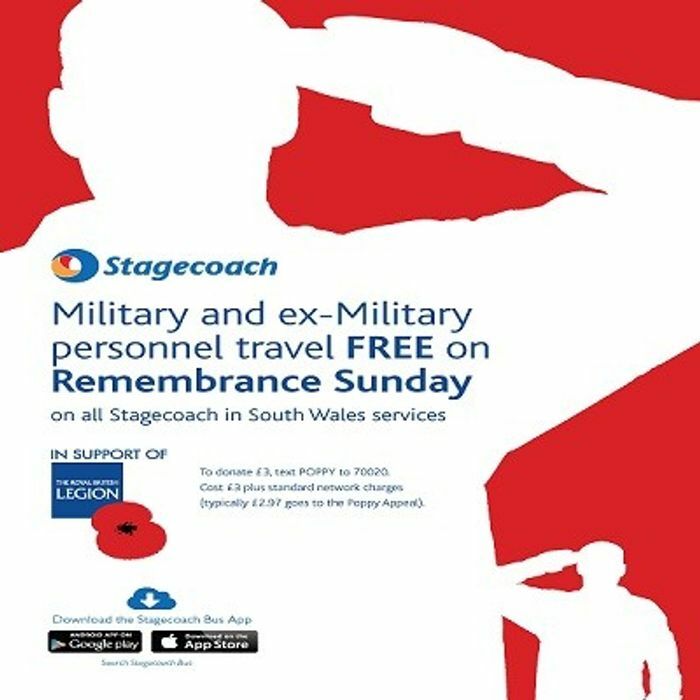 On Remembrance Sunday, Stagecoach in South Wales will also be offering free travel to Armed Forces personnel carrying a military ID card and to veterans wearing the veteran’s badge. There will be posters on board buses encouraging text to donate. Remembrance Sunday is a day for the nation to remember and honour those who have sacrificed themselves to secure and protect our freedom. Stagecoach in South Wales, Managing Director Nigel Winter said; “Once again, we are proud to be supporting Remembrance Sunday in this way by. This year, 100 years after World War I ended, we are supporting our armed forces to say Thank you to all who served, sacrificed and changed our world. Stagecoach Group signed the Ministry of Defence’s Armed Forces Corporate Covenant in support of the Armed Forces Community. As a signatory of the Covenant, the company recognises the value serving personnel; regular and reservists, veterans and military families contribute to both the country and businesses across the country. Next Gen Anti Theft Rucksack with Inbuilt Combo Lock - 3 Colours!